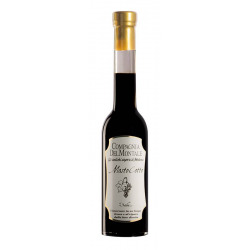 Traditional Balsamic Vinegar of Modena as Extravecchio (Very old) and aged at least 25 years. 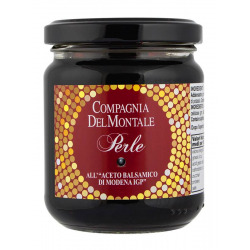 From sunny hills, from the best grapes in the Modena area. Then, it's time, passion, care, attention and research. 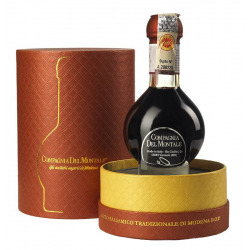 This is how the Traditional Balsamic Vinegar of Modena PDO Compagnia Del Montale is created. 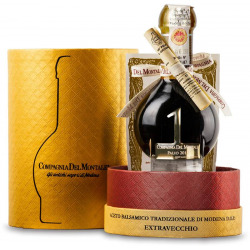 Before reaching the market, the Traditional Balsamic Vinegar of Modena ages in small barrels made up of different types of wood, then it is evaluated by the Commission of certified tasters. 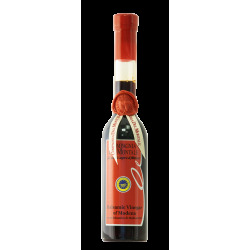 After passing a strict test, it is bottled and marked as PDO. The tasters express their evaluation through scores, necessary to classify the Traditional Balsamic Vinegar of Modena as Extravecchio (Very old) and aged at least 25 years. 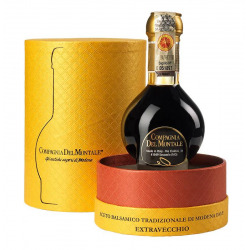 Its container must be unique as for shape and capacity: Giugiaro bottle.